As soon as I finished posting about the laptop cases I was coveting the other day, I had a vision of exactly the kind o laptop bag I’d like to make for myself. I sketched out a design with a padded internal section, various extra pockets, and a pair of shoulder straps that each encircle the pouch and must be clipped closed, in order to complete the strap and close the pouch flap. 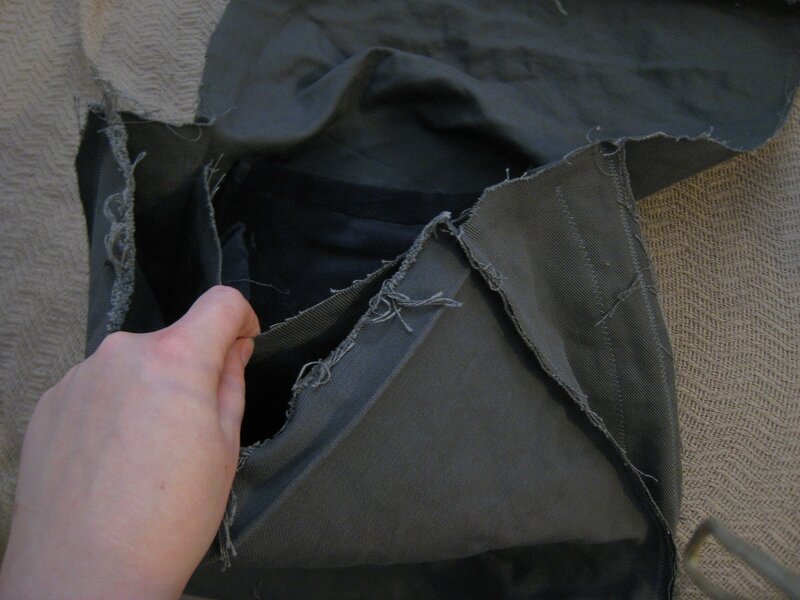 Now, I am not a great seamstress. I don’t follow patterns well, and I know very little about the intricacies of sewing. I only figured out how to automatically wind my bobbins Friday- before, I thought I was just doomed to poorly tensioned seams. But this weekend, I had time, good bobbins, a vision, and a hearty confidence in my ability to reduce a theoretical bag structure to straight lines. Finally put that engineering degree to work and all. Incidentally, that’s always the mindset before I tackle a freehand sewing projects, and most of them haven’t turned out so well. 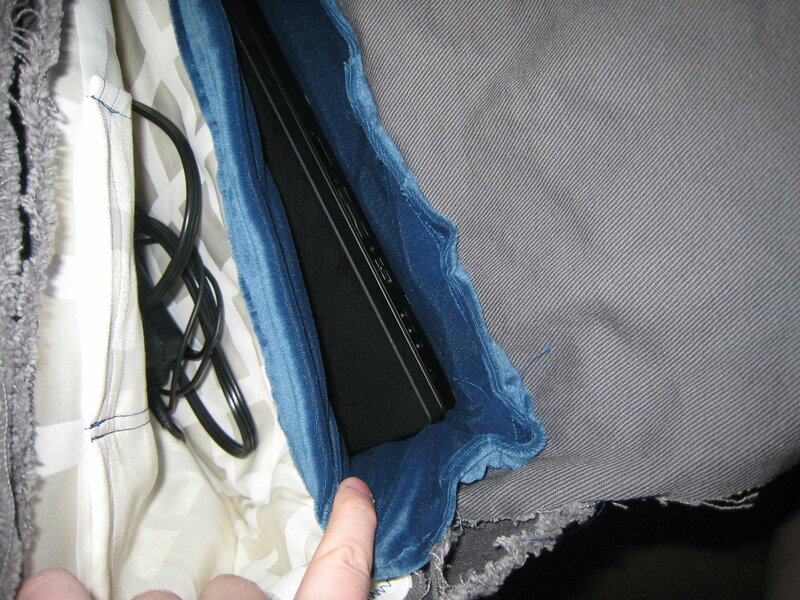 I made the case out of a gray denim material left over from another project I’ve been working on, with a double layer of fleece to pad the laptop compartment. It’s lined with a portion of a very unfortunate-looking velvet skirt that I thrifted, and some shiny white fabric from a remnant bag I was given lined the other compartment, and made a few pockets. I made a second case out the grey denim to put the first, rough case in, to both conceal the seams easily and give it more strength. Voila! I’m rethinking the strap ideas, but I need to add those, bunches more pockets, and dig up some sort of something from my fabric pile to use as a bias tape to even out the rough edges. 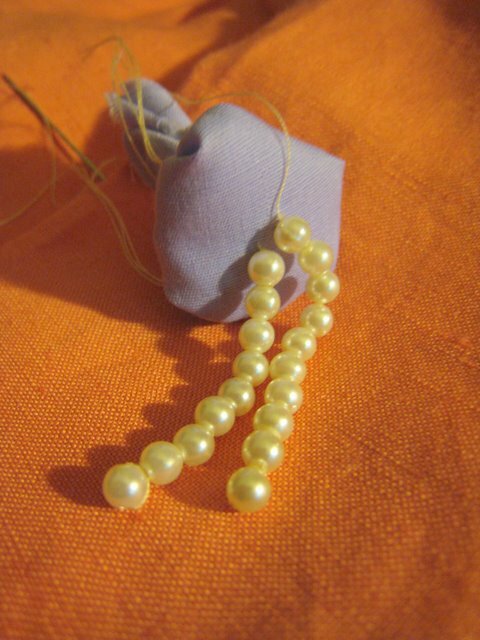 I’ve signed up for a for-real sewing class this weekend, so ideally that will lend some polish to my enthusiasm. Photos will ensue, if I like how it turns out. More photos of the construction are here. 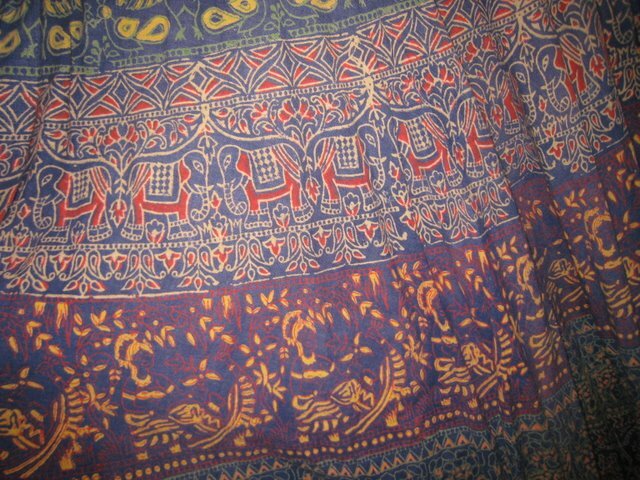 Cotton wrap skirt with colorful print (detail shown), $4. 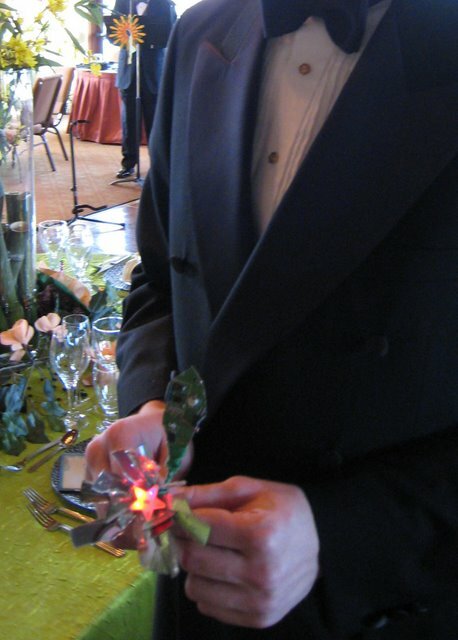 I’ll need to pin it closed- it’s basically just a big bit of cloth with a waist tie. But it’s wonderful, and has pictures of five kinds of animal and two different people on it. 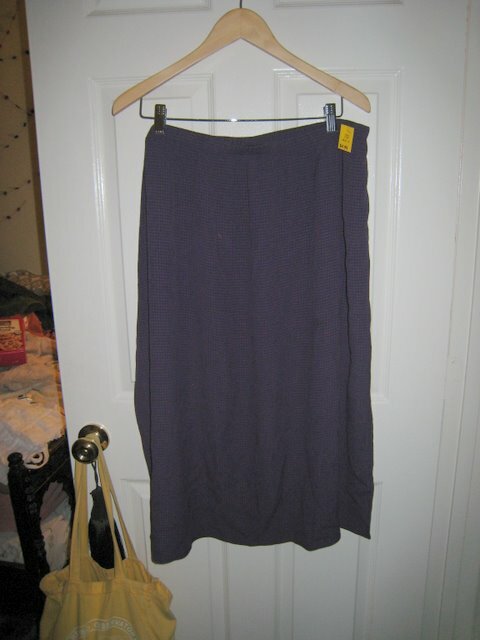 Shapeless, huge purple skirt, $5. It’s a very light, swishy fabric, so I’ll take it in and make a proper waist band instead of the elastic mess. 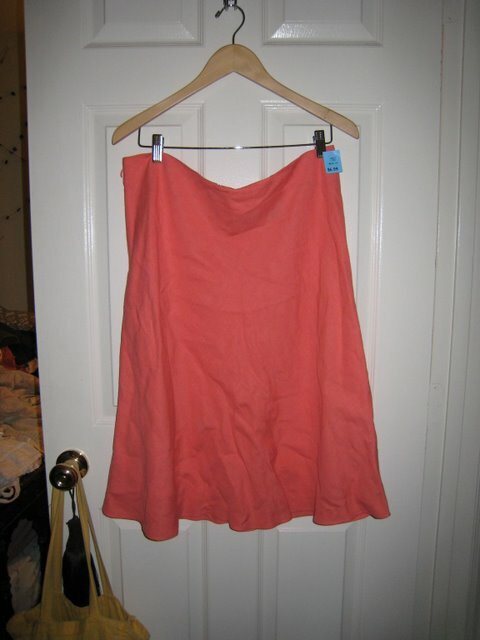 Pink Linen skirt, $7. 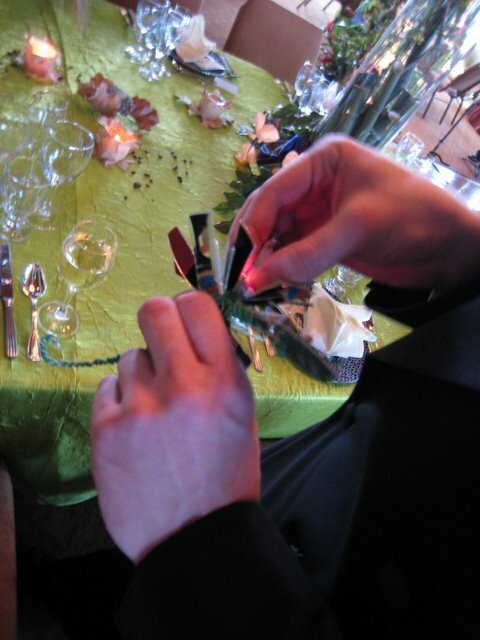 Extravagance! 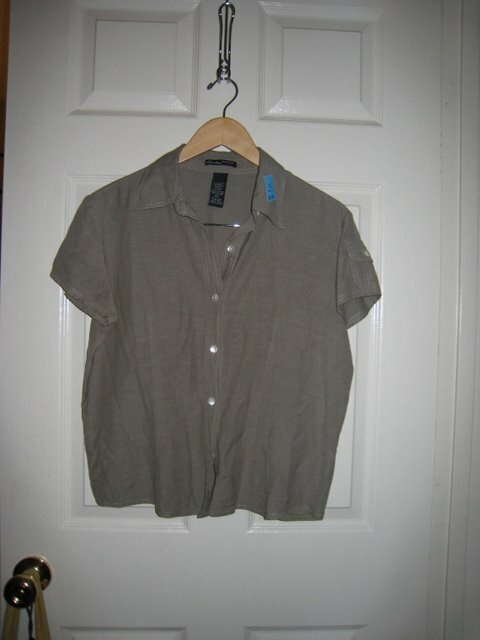 Grey blouse, $4. Soft and light, plus a functional sleeve pocket. For…what? 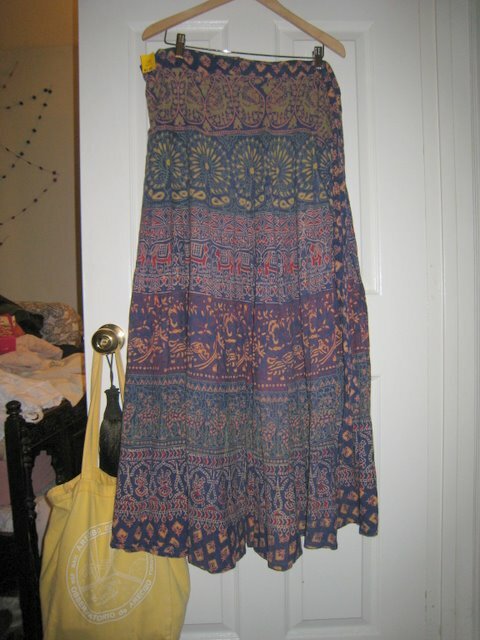 I might get the urge to add something to the bottom hem, but it will work nicely as-is. 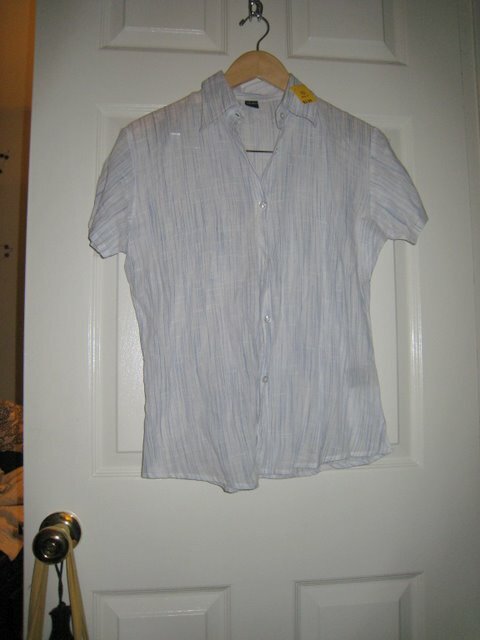 White cotton blouse with blue and purple threads, $4. Has some small stains, which will hopefully wash out. 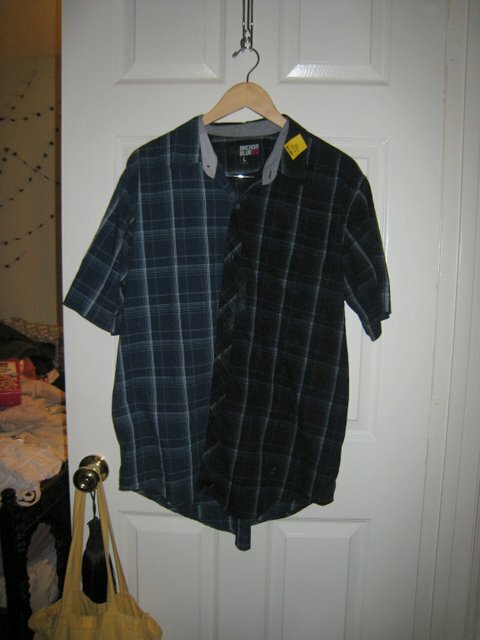 Navy and white plaid button-down for my darling guy, $4. Oddly dirty, so half of it is darker because I was soaking it. Needs a good washing. Former owner had a dog and some fine white powder? 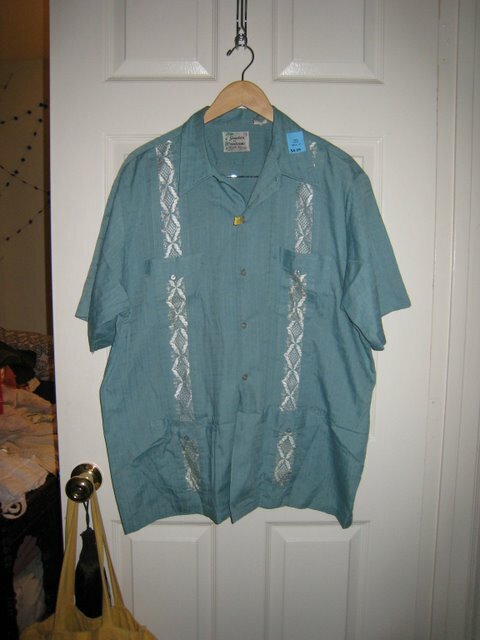 A blue-green guayabera with white embroidery for my ookle dumpling, $5. Guayaberas are so snazzy. Even when they’re made in Korea, and a have a little frayed seam. The latter, I can fix, and the former, I can ignore. About half of the stuff I find at the Salvation Army is something that needs to be resized, or sewed on to make it truly cool. 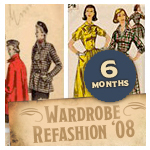 I’ve been getting ideas and inspiration from the newest link, Wardrobe Refashion– a group blog of people who challenge themselves to buy nothing new, and remake old and used stuff into awesome other stuff. Goodness, my project plans just keep piling up. 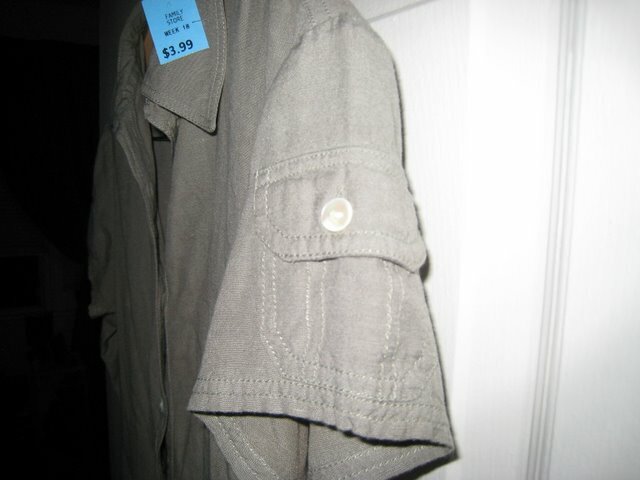 Also, I need to suggest to the Salvation Army-Little River people that they not staple price tags tot he clothes, especially in collars and other places where holes are noticeable. I started March’s goal with three listed projects. I only finished two things, and I started a bunch more. 1) Scarf, knit. 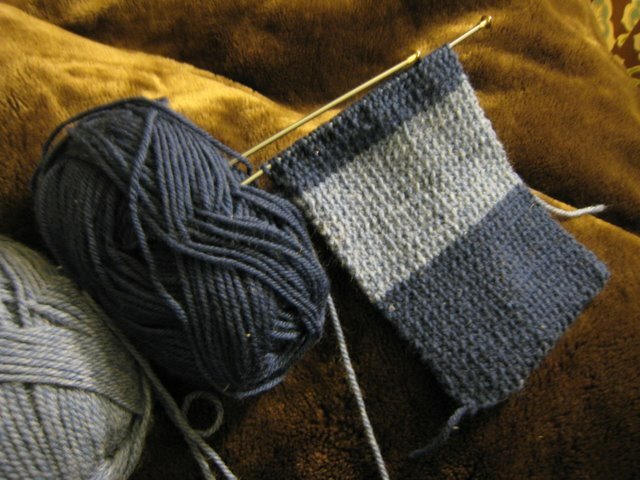 Progressed ~6 inches, but have succeeded in carrying it around with me, so I’m getting more done these days. 2) Quilt, sewn. No real progress, though I looked up quilt making, and found a new stack of squares. 3) Weighted Companion Cube, wood and fabric. Bought all the fabric, which is now buried under other items in the Gentleman Friend’s apartment. 5) Nuno-zoris, woven. I’ve marked a stack of teeshirts for dismantling. I’ve also begun debating whether to use a cord base, or try something less bulky, like another teeshirt strip for a base. 6) White Dress, alteration. I’m using the unnecessary waist ties to replace the uncomfortable shoulder straps. I’ve chopped off the straps and the ties, and now I just need to fit it and sew it back on. 7) Lampshades, watercolor. Got some lampshades for practicing from my gentleman friend’s lovely mother. 8 ) Plate, painted. 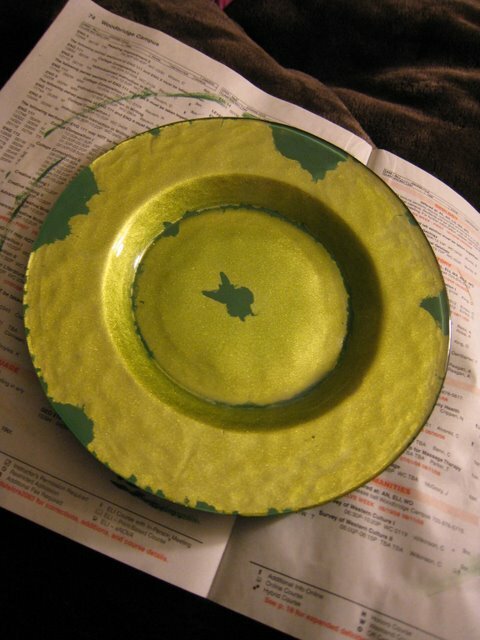 I had a ratty old plate- glass with a shiny paint showing through- but the paint was chipping. I fixed it up with a dark green underlay. I hope it chips more, or maybe I should chip it more, because I wish the chipped pattern looked cooler. Plus, if it chipped more, I could add a third color. But for now, finished! Ok, so I started more projects than I had, finished two projects I hadn’t started, and mostly just gathered supplies. But I have been finding more ways to work making things into my day, and it’s been very satisfying to plan out how to remake and refurbish my stuff so it works better. All in all, relaxing and refreshing, and woo. So, April! I had this one planned out already, and it’s partially started. In April, I’m gardening. Since forever, my parents have gardened, and I tried deck vegetables last year. This year, though, I have a bright, sunny deck, with areas of partial shade, a composter, and a plan. Well, not really a plan, but I have a hydrangea, a kalanchoe, and a rosemary bush somewhere about. I killed a couple of houseplants this winter, and I’ve got the remnants of the pots from last year’s latent peppers, so I have a few empty planter spaces. Plus, my mother informs me that my father, who shows his love through vegetables, has already got a few tomato plants started for me. She’s packing up some herbs, and there were strong hints at a geranium. I am told that geraniums are difficult to kill. We’ll see! I want to plant some vegetables and flowers in my garden, with a view to both edible harvests and beauty. I need a bigger planter for the hydrangea, so that I can grow that to a viable bush. I’ll also need to get the composter going again. Biking Person was kind enough to give me two spaghetti jars of dirt, so I can get the cultures started, as soon as I find an outdoor plug for the unit. Because it should probably stay outdoors, to isolate it from the housemates, just in case of smells. I’ll also need to build it a tiny hut, since we have a tiny, curious dog (Ruby), and its lid doesn’t latch shut. Plenty to do, and I’m psyched by the prospect of veggies and hydrangeas (my favorite flowers) and creating things from dirt, sun, and water all summer! And possibly fall. It is DC, after all, the summer lasts. I am slightly nervous, given my tendency to kill plants, about how this will work, so I’ll probably be calling my mother for advice pretty often. I wish there was some sort of gardening reference for total deck garden beginners. Actually, there probably is. Hm. Al Gore is publicizing the environment again. This time, it comes with professional ad-people and $300 million dollars, instead of a small documentary about the little Power Point that could, but hey, green’s come a long way since 2006. Gore wants to push that momentum into a popular movement that will convince politicians to actually maybe please pretty please do something sensible? Like, we’ll be more energy efficient if you dudes stop ignoring the problem. How about that? The group’s name (and motto, too, I guess) is “We Can Solve It“, and some of the first few spots are airing now on a tv near you. In an NPR story on the new campaign, Al Gore’s own carbon footprint was brought up again. If you recall, it was reported last year, right after his Oscar win, that his personal energy use at a TN mansion was some ridiculously high number- though even Fox News reported on his solar panel installations and carbon offsetting plans. Not bad, considering their regular columnist on environmental matters thinks global warming is a vicious myth. And yes, the column is named “Junk Science,” and no, I’m pretty sure they didn’t mean it to be funny that way. The NPR story highlighted an important part of what Gore’s message is going to have to be, though- to tackle the environmental problems we’re creating, we’re going to have to think and live differently. And the man who’s fronting and financing a campaign to tell us to do this, and write our congresspeople while we’re at it, needs to set a squeaky-clean tech example. John Tierney over at the NYT wrote a piece last week on how to remind people to be green- nudge them into making good “abstract” and “long-term” choices by tying their carbon footprints, or resource use, or what have you- into a real-time display, like a mood ring or changing LED jewelry. He argues it would instill a sense of connection to our choices- plus, it will facilitate some public green-upmanship backed by facts, not hype. It’s an interesting read. I’d like Al Gore to start the ecomood ring trend- him and everyone else who argues for the environment. I’m in, of course- mood rings are sweet, almost as sweet as living up to your own standards.